A day care centre that looks after ‘the little Skegnessians of the future’ is celebrating after scooping the top honour at the Skegness Business Awards. Little Learners in Lumley Avenue won Best Care Provider and then went on to take the Business of the Year prize after a night that saw successes in 10 categories. The nursery cares for under 5’s and has an outstanding Ofsted report for the way it offers learning through play and prepares children for school. Judges were impressed with the facilities, the dedication, focus and qualifications of the owner, Marie Walker, and her team. More than 200 people attended the glittering ceremony at the Southview Park Hotel, many more than the first event held last year. The night was organised by Skegness Partnership and sponsored by the Coastal Communities Fund and a host of local businesses. Winners, sponsors and speakers were introduced by Melvyn Prior of BBC Radio Lincolnshire. MP for Boston and Skegness Matt Warman, who was one of top table guests, said: “This year’s event is bigger and better than ever because Skegness is a town that is going from strength to strength. “Last year I spoke about the attempts to extend the season and slow but steady progress is being made to help this happen. “The Skegness BID goes to the ballot in March and I would urge you all to vote because this will make a huge difference to the coast. 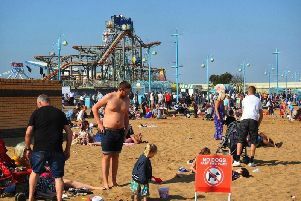 “Money is going to the pavilion site to redevelop it into a community hub and this shows a real willingness by the Government to invest in areas like Skegness. Accommodation Award (REST ASSURED / SECWHA) - Carron House; Best Attraction 2016 (THE ROYAL HOTEL) - Skegness Aquarium; Best New Business (HODGKINSONS SOLICITORS) - Chuckling Cheese; Business Person of the Year (SKEGNESS & DISTRICT CHAMBER OF COMMERCE) - Karen Sheppard, People First Mobility; Café of the Year (LICENSED VICTUALLER’S ASSOCIATION) - Coffee Owl; Care Provider of the Year (DUNCAN & TOPLIS) - Little Learners Day Nursery Community Award (HILDREDS CENTRE - The Coastal Eco Centre; Customer Care Award (KIRKS QUALITY FOODS) - Seacroft Mobility; Retailer of the Year (MKM BUILDING SUPPLIES) - Kirks Butchers; Young Employee of the Year (FIX AUTO SKEGNESS) - Peter Blevins, chef at Caxton House.